These Sweet Potato Breakfast Muffins are too good to be true. Irresistibly moist, subtly sweet, and even better – they’ll fill your home with those warm spices of cinnamon, brown sugar and nutmeg as they bake. 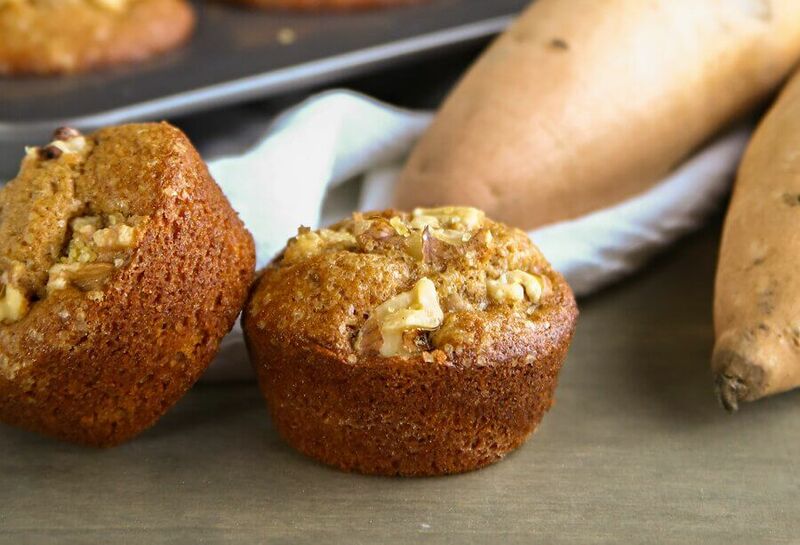 Quick and easy to make, we promise these Sweet Potato Breakfast Muffins will satisfy your hunger and provide plenty of energy to take on the day! Preheat the oven to 350°F. Grease muffin pan. In a large bowl, lightly whisk eggs with sour cream, oil and sweet potato mash. Beat in the brown sugar and vanilla. Add flour, baking powder, cinnamon, baking soda, nutmeg and salt. Fold in half the walnuts, mix until just combined. Divide the batter between the 12 prepared muffin wells. Sprinkle with walnuts and raw sugar. Bake for 18 – 20 minutes.